On May 1st 2018, I received the official acceptance from Science to Data Science (S2DS) to embark on a five-week intensive project-based data science bootcamp this summer. Based in London, the S2DS is a full-time programme that aims to tackle commercial data science problems with participating companies ranging from emerging start-ups, charity organisations, SMEs and large multi-national enterprises. The outcome of the programme will have a real impact on the companies’ live product and services. Last but not least, I will get to join in the growing alumni network of over 400 Fellows of 60 different nationalities with more than 20 different disciplinary backgrounds. How did you go about getting into it? Getting into S2DS is a competitive process, whereby only a total number of 90 individuals are chosen to participate in one of Europe’s largest data science training programme. I then took part in a Skype interview. It was a little while before I found out I had been accepted. Why did you decide it would benefit you and your research? I decided to take part in the S2DS programme in the middle of last year. I was searching for a summer programme where I can learn more about the emerging data science field. Through several searches, I chance upon the S2DS programme online. Reading the summer programme outline and past participants’ post-programme reviews, I felt that the S2DS programme fits in well with my needs. Apart from the theoretical learning, the programme provides an added bonus for a real-life industry application and co-working experience with industrial companies. In addition, the programme also provides networking opportunities for me to build my career in the data science field. Taking part in this programme will have an impact and influence on my PhD research where I am developing an Intelligent Transportation Analytical Models for SMEs in the private coach industry. current companies thoughts/concerns of the data science field. The experience gathered through the S2DS programme will shape my PhD approach to further scale the projects’ research impact. Look out for my blog post (and Twitter) on my S2DS experiences this summer! 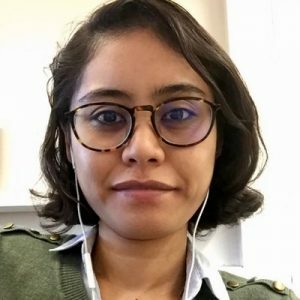 Aishah Selamat is one of our UK Data Service Data Impact Fellows. Aishah is a second year PhD student with the Faculty of Science and Technology at Bournemouth University. Her PhD research is co-funded by Bournemouth University and County Coaches (UK) LLP (a company of Travelmanagement4u.com). Aishah’s research aims to develop an Intelligent Transportation Analytical Model for SMEs.